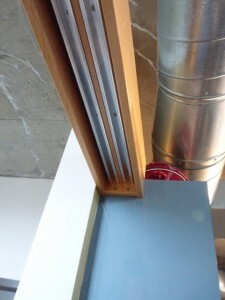 the valance box attached to the kitchen cabs which were securely screwed too the wall. finished projectI have great news if you have very tall ceilings in your condo or home. 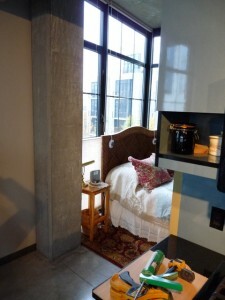 We have a Pearl district in NW Portland that is the hot-spot to get a condo. There is a mix of old warehouses and new buildings where it’s popular for some reason to have 11′ or 12′ tall ceilings and have the interior walls go from floor to ceiling. Dramatic but hard to fill with doors of any kind, and probably tough to heat too. If you have 8′ or taller ceiling height, and would like to have Shoji or a barn-door set-up, there isn’t a need to have the tracks on the ceiling and have (up to) 12′ tall doors. I have developed a system that puts the doors at a typical height (usually 80″ to 84″) or match the existing height of your doors without building walls or lowering the ceiling. 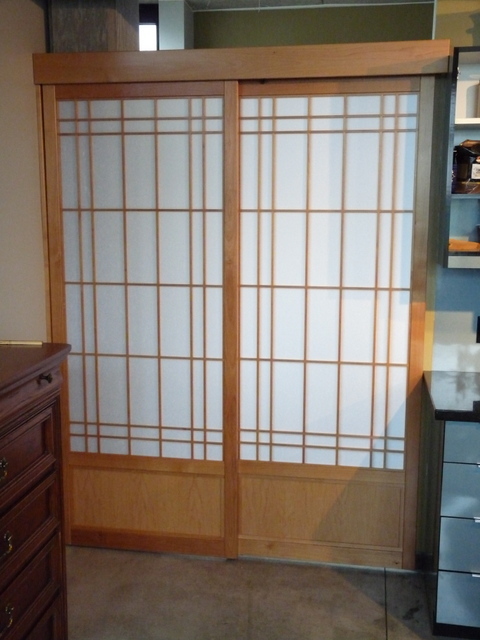 The client can have the space above the tracks left open or covered with a transom or Ranma (as they are called in Japan). 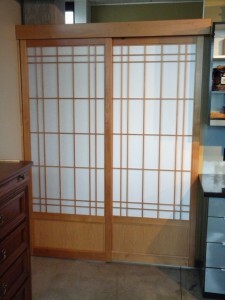 What fills the space might be a shoji-like screen, or a carved panel. It might be a geometric pattern; like broken ice or maybe snowflakes. It may or may-not have rice-paper in it. The installation is almost typical for me, except I build the valance for the upper track like a “I” beam or “strong-back”. Depending on the width of the opening, I make the faces of the valance box wider. I have easily spanned 9′ with 3 doors hanging from it. It was so strong that I could do pull-ups on the installed valance box. In order for this to work, there must be existing walls on either side. And if the client decides to move, they can remove the screens and valance box and take them along.